This section is a listing of all of the applications I have developed to help integrate my home. It is currently incomplete. Card Filler is a simple application that I created to make my mobile music experience easier. I have a PDAPhone which takes Mini-SD cards, and can play MP3's from them. Card Filler connects to my Media Center software, MediaDaemon, and also the MySQL Database. From there, it allows me to choose which playlists I would like to mix up. Next, the software randomely selects songs from those playlists, allowing me to cull out any tracks I don't want to listen to. Finally, the songs are transferred onto the MiniSD card, and downsampled to 128kbps if required (to save space). 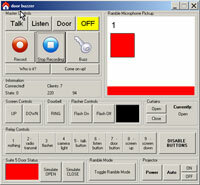 The DoorBuzzer application interfaces with visitors to the front door, among many other functions. See the Doorbuzzer section. 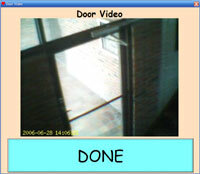 The DoorVideo application displays a video feed from the front door of my building. More information about the video hookup is coming soon! The DoorWatch application may look cheesy, but it's colourful interface is designed to grab attention. This tiny application sits on my computer at work and runs in the background, establishing a connection with the DoorBuzzer application. When someone buzzes, it pops up this colourful window, complete with a video picture of the person waiting at the door, and makes a lot of noise. This gives me time to answer the door. This feature is most useful for deliverymen... I can see how big the package they are holding is! Learn more in the Doorbuzzer section. The EventMachine application handles automated events, macros, and special functions. See the Automation section. This command can be started by any other application (such as a desktop shortcut) and will turn light "A3" on. The syntax and functionality is similar for the other two applications. KeyLinc is a customizable Keyboard Hook application. I have created a "public" version of this application and released it under the name SuperKeys. My "in-house" version has additional functionality, such as integration with the Logitech G15 keyboard, playlist editing and control, and more. See videos of this application in action on the Media Center page. Although the MediaDaemon application has a GUI, it's really only for debugging. This application handles everything to do with media. 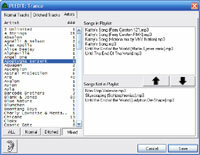 It deals with keeping playlists on the MySQL database in check. It interfaces with WinAmp, controlling play, stop, etc. It interfaces with Media Player Classic, starting and stopping the files. To see it in action, check out the Media Center page. 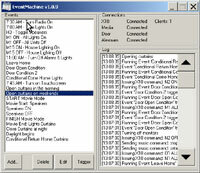 The PowerLinc application interfaces with the X10 ActiveHome Pro unit, providing X10 status updates to all listening applications, and accepting commands which it passes over the powerline. See the Automation section. 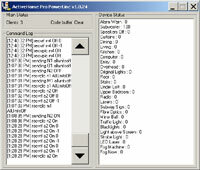 An older version of this application exists, for interfacing with the SmartHome PowerLinc serial-based X10 controller. One day, this controller smoldered and stopped working, I'm still not sure why. For that reason, I've switched to the X10 unit. The good thing about the modular nature of my setup is that hardware can easily be replaced when needed, with minor changes to only one software application. The Touchscreen application provides a touch-input interface for controlling the home. See more in the Touchscreen section. 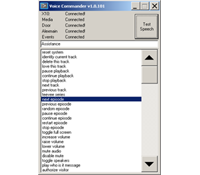 The Voice Commander application interfaces with the radio watch. It listens and responds using Microsoft Speech API. See the Watch section.